The Eurovision Song Contest 1968 was the 13th Eurovision Song Contest. The contest was won by the Spanish song La, la, la, performed by Massiel. Originally Spain entered Joan Manuel Serrat to sing La, la, la, but his demand to sing in Catalan was an affront to Francoist Spain. Serrat was withdrawn and replaced by the very popular Massiel, who sang the same song in Spanish. La, la ,la was written by Manuel de la Calva and Ramón Arcusa. The 1968 venue was the Royal Albert Hall, a concert hall situated on the northern edge of the South Kensington area, in the City of Westminster, London, England, best known for holding the annual summer Proms concerts since 1941. 1968 was the first time that the Eurovision Song Contest was broadcast in colour. The countries that broadcast it in colour were France, Germany, the Netherlands, Switzerland, and Sweden; in the United Kingdom it was broadcast as an encore presentation on BBC Two the next day. Also all of Eastern Europe and Tunisia broadcast the contest. Katie Boyle hosted the contest for a third time. In the week before the contest, the UK was the big favourite to win and the only question was: who would come second to the UK? Congratulations was already high in the charts all over Europe. Cliff Richards came on stagein a blue suit to a welter of screams and great expectations. He did not let anybody down, moving on stage with a hen held mike anf giving the song his all. The screams never stopped and the applause at the end was exceptional but after a bizarre voting he finished in a very disappointing 2nd place. The spanish entry La, la, la beat the favourite and Bill Martin (writer of the UK entry) called the Spanish song a piece of rubbish. The Norwegian song Stress originally finished second in the 1968 Melodi Grand Prix, but was promoted to the Norwegian entry when the winning song Jag har aldri vært så glad i no'en som deg was withdrawn from the contest by its composer amid persistent allegations that it plagiarised the 1963 hit Summer Holiday by Cliff Richard. This is the only occasion on which the MGP winner did not go forward to Eurovision. Only one artist returned in this year's contest. The winner of the 1962 contest, Isabelle Aubret, returned once more for France. In May 2008, a documentary about the ESC 1968 by Spanish film-maker Montse Fernández Villa was broadcast. Yo viví el mayo español, centred on the effects of May 1968 in Francoist Spain, and alleged that the 1968 Eurovision Song Contest was rigged by the Spanish dictator Francisco Franco, who would have sent state television officials across Europe offering cash and promising to buy television series and contract unknown artists. The allegation was based on a testimony by journalist José María Íñigo, a TVE employee at the time, who claimed the rigging was common knowledge and suggested that Spanish record label representatives offered to release albums by Bulgarian and Czech artists (neither Bulgaria nor Czechoslovakia were members of the European Broadcasting Union at the time). 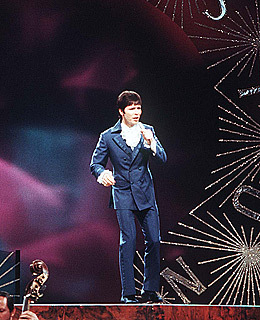 The documentary claimed that the contest should in fact have been won by the United Kingdom's entry Congratulations performed by Cliff Richard, which finished second by one vote. Massiel, the performer of the winning entry, was outraged by the allegations, and claimed that if there had been fixes, other singers, who were more keen on Franco's regime, would have benefited. José María Iñigo, author of the statement in the documentary, personally apologized to Massiel and said that he had repeated a widespread rumour. Both Massiel and Iñigo accused television channel La Sexta, broadcaster of the documentary, of manufacturing the scandal.